Well done to all who took part in the Biggest Loser Road Race/Walk. 250 people took part between runners and walkers and that’s not including the children that run from the Grotto. Unfortunately a couple of men got lost between Monageer and Boolavogue. Next year we will have to put up better directions!!!!! A hugh thank you to all who helped out on the day, drivers, stewards, photographers, time keepers, water stations and the ladies who helped out with the refreshments in the Harrow after the race. Thanks to Eithne Turner for the use of her premises for the refreshments. On Sunday last the Biggest Loser Cycle took place. It started at the GAA complex in Monageer with 100 people getting the dust off their bikes after the winter. Some took the long route which consisted of 50km taking in The Harrow, Ferns, Killabeg, Enniscorthy, Oulart, Raheenduff, Boolavogue and back to the complex. The first home on this cycle was Paul Bolger representing the Killabeg team, followed by Trevor Swaine & Peter Kirwan. First home for the women on this cycle was Carol Sinnott who was helping out the Crane team, followed by Mary Carton and Orla Gahan. On the 16km route which took in the back roads between Boolavogue and Monageer – the first home was Declan Kelly representing Boolavogue followed by Stephen Murphy and Keith Swaine and first home for the ladies was Michelle Daly representing Killabeg and followed by Mary Breen. The first underage home was Edward Kinsella followed closely by Evan Dunne. A great day was had by all due to the good weather and the lovely tea and sandwiches provided by the ladies in the complex after the cycle was a much welcome treat. A hugh thank you to all who helped out in any way either by driving, standing at junctions, taking pictures and making the tea. Without all this help the cycle would not take place. 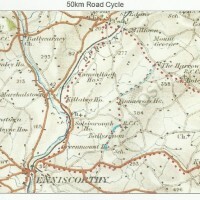 The attached map shows the long cycle route. It starts at Monageer Boolavogue GAA Complex, Tinnacross, The Harrow, Ferns, Clone, Kilabeg, Solsborough, Enniscorthy, Oulart, Raheenduff, Boolavogue, The Harrow, Tinnacross and return to GAA Complex. The red dot line is the start and the blue dot line is the finish. On Friday night the 5th February at 8.30 pm there is a poker classic in the Hall in Monageer. Tickets to play cost €20 with refreshments served. This is being run by the Crane team and they would like your support. On Sunday February 7th, The Coolgarrow team are hosting a FIFA 16 tournament in the Clubhouse. U8 competition and over 8 to Adult competition. €5 entry. Prizes for winners and drinks and treats provided. Please text Paul on 083 3304859 to register. On Friday the 12th February at 9pm the Monageer Teams are all joining together to host a Table Quiz in the Monageer Tavern. Tables cost €40 per team. Your support would be appreciated. On Saturday the 20th February, the Boolavogue teams are putting the leaders out against each other in the Harrow to dance the Jive. This promises to be a very entertaining night. On Sunday 21st Coolgarrow are also having a Kids Bingo and Cake Sale from 2.30 pm to 5pm. Please come along and support. The Crane team are also selling Team pictures of the County Final for €10. Contact Tommy Breen for further information. Over the next couple of weeks the Knockduff Team will be selling tickets for a trailer load of firewood. €2 per ticket or €5 for 3. Well done to all who took part in the Bog Run. 120 people lined up at the starting line at 2 pm. The first home was Peter Breen in a time of 22.04 and hot on his heels was Matt Stafford with Shane Gahan following close by. First home for the women was Georgina Whelan in a time of 29.08 and close by was Ruth Walsh with a close finish for third between Orla Stafford and Orla Gahan. The leaders race was won by Knocknaskeaugh with Peter Breen running for Mick Sweeney, followed by Niall O Loughling representing Carrigeen/Ballycarrigeen and third was Declan Kelly for the Boolavogue Team. A great crowd of children had fun on the small course set up especially for them. It was great to see them training for the future of our bog run. A hugh thank you to Jim & Josie Gahan, Ted Nolan and Danny Murphy for the use of their land as without this land the bog run would not take place. Also to the stewards, photographers, Brigdet Sinnott for First Aid and to all those who helped in setting up the course. Without all your help this event could not take place. We now look forward to our cycle on Valentine’s Day starting at 2pm at the GAA Complex.